Did this Boston company finally figure out how to run a good wine club? In my experience, some of the best wine recommendations I've received have come from independent local restaurants with a focus on discovery. Energetic hipster sommeliers try all kinds of stuff so they can present funky off the beaten trail lower production wines from lesser known regions that run circles around higher production commodity wines. As long-time readers know, I'm no stranger to Total Wine, Costco and Wine .com. But there comes a point when you're tired of the usual suspects and you want to explore. And you want to do so without making mistakes. If you're not making it out to local restaurants as much as you'd like and you're thirsty for evolving new wine selections from respected local sommeliers, Boston-based Upper Glass might be just the model you're looking for. The best way to get a feel for Upper Glass, to give them a try, is with their Monthly Curated Selections. 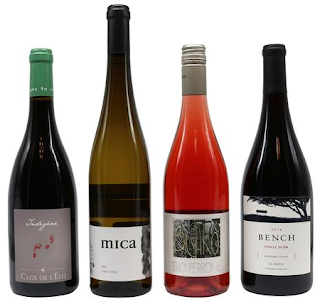 For $80 (with free shipping in the Boston area within route 495) they'll deliver an assortment of four wines to you each month. If your preference is reds only, they've got an option for that. If you want to explore specific varietals like Pinot Noir or Cabernet, or "holiday wines" or "sparklers" they offer one-time four bottle collections you can order. They reached out and asked if it would be okay to send me a complimentary shipment. A nicely packaged box with four wines with information about each was included. The shipment I got happened to be targeted for Thanksgiving. The wines were selected by Jen Fields, the Wine Director at Chef Michael Scelfo's Harvard Square restaurants Alden & Harlow and Waypoint. She was previously General Manager at Toro (one of Chef Ken Oringer's many restaurants that I adore). Alden & Harlow and Toro were a couple of my favorite meals in the past couple years so it felt like this offer, and the entire Upper Glass wine discovery model is eerily targeted at me. Silky smooth and gorgeously free of off notes. A hard thing to accomplish with such flavor intensity and low alcohol. Outstanding and impressive in the ~$20 price point. A sweet sparkling rosé from Piedmont, Italy. 5% alcohol. Creamy sweetness kept in check by some amount of acidity. A great wine to enjoy with dessert, especially but not exclusively for guests who don't typically like wine. Absolutely delicious. A French (Loire) red blend of 50% Gamay, 30% Grolleau, 20% Cab Franc. Drinks like a cru Beaujolais with more stuffing. Anchored by unmistakable Gamay notes with stuffing provided by the other grapes which have shades of Rhone influence. Fantastic. Starbright with racy acidity. Strong linear presence with satisfying weight. I get a hint of a soapy aftertaste on the finish that diminishes what is an otherwise outstanding wine. I think Upper Glass is on to something terrific here. The key is going to be whether they can stay true to their model and avoid the temptation to push out wines that are driven by forces other than the carefully selected options from local sommeliers. I think Wine Folly does a good job describing why so many wine clubs are so very bad. Definitely check them out if you're in the Boston area. I hope they expand to other areas and/or open up more shipping options. I think a lot of people would really go for this. I realize this is cutting it close to Christmas so I wanted to get this out now on the off chance you might be able to take advantage of a couple deals they're running. 15% off a 3 Month Subscription with code 15OFF3 with the first shipment arriving before New Years. These codes are good through Dec 25, 2017 and could make for a great last minute gift, even for...yourself! My thanks to Upper Glass for the sample shipment. I wish them well. Really like the model here. Bin Ends Wine is offering the 2012 Cherry Pie Stanly Ranch at 3 bottles for $99 (link). As a comparison point, Total Wine sells this bottling for $44.99 when purchasing 6 or more mixed bottles. I've had various vintages of this wine before and I'm a fan. It's big and bold, weighing in at 15.5% alcohol. It's a little back-vintage at this point but I bet it's not over the hill yet. Worth a try if you like a big bold California Pinot Noir. I know I do. I'll update this post when I hear it's sold out. Update: Wine is not sold out as of yet, but I picked this up yesterday and popped it just now. They gave me the '13 (offer was for the '12) but I'm not complaining. The wine is exactly what I'd hope for. Full throttle flavor yet light in color as CA Pinot should be. Ample acidity and surprising tannic grip. Just the slightest bit of heat as you'd expect from something that's 15.5% abv. I can see my way to 92+ points on this.